There were a lot of compromises when Stevie and I made the decision to leave New York. We left Stevie’s family, some of our best friends and most trusted mentors, and a whole lot of amazing food. Every spot on the globe has something all its own when it comes to food–some signature dish or cuisine that is uniquely local and difficult to replicate. I think the one thing that differentiates New York is that the flavors of the world have quite literally migrated and established themselves in restaurants and bakeries and sidewalk stands and food trucks throughout the city. You could taste the world without ever leaving the five boroughs. One of the things Stevie and I miss the most is the variety. After we started dating, we had a habit of hopping in the car and driving to Manhattan every Friday night for dinner. We had a favorite sushi restaurant, Yoko, in the West Village where we ate so often that we didn’t even need to order. The chefs knew our tastes and favorites, and would begin sending beautiful plates you couldn’t find on the menu over to our table as soon as we sat down. Other nights, we would just pick a flavor or type of cuisine, look up the name of some random restaurant that served it, and go. We haven’t been able to settle into quite the same routine since we left New York. Now that the kids are getting a little older (and Henry is finally entering the reasonable phase that follows the fit-throwing insanity of the two’s and early three’s), we’re hoping to get back to being adventurous. Sure, there aren’t nearly as many options here in Lincoln, but there is some really great food in this town and a lot of places we haven’t even had a chance to try yet. The one food we have thoroughly tried here though (and have been thoroughly disappointed with) is the pizza. Nobody does pizza like New York. We tried every pizza place in Lincoln since moving here in 2011. Every. Single. One. Lazzari’s was our frontrunner there for six months or so back in 2011-2012. Crust was almost true NY-style and the sauce was decent. Then one day the sauce started tasting a little too sweet. (Hear this now people, sauce should NEVER be sweet! You add pinches of sugar to cut the acidity of the tomatoes. That’s it. If it’s sweet AT ALL, you’re doing it wrong!) We tried again a few weeks later, sauce was still sweet and the crust was burned. One more try a few months after that and we had too-sweet sauce, overdone crust, and so much extra cheese piled on that the pizza slices were drooping in our hands even folded in half. Strike three. We’ve never gone back. Yia Yia’s gets a pass because it’s unique, and they have some delicious flavor combinations. 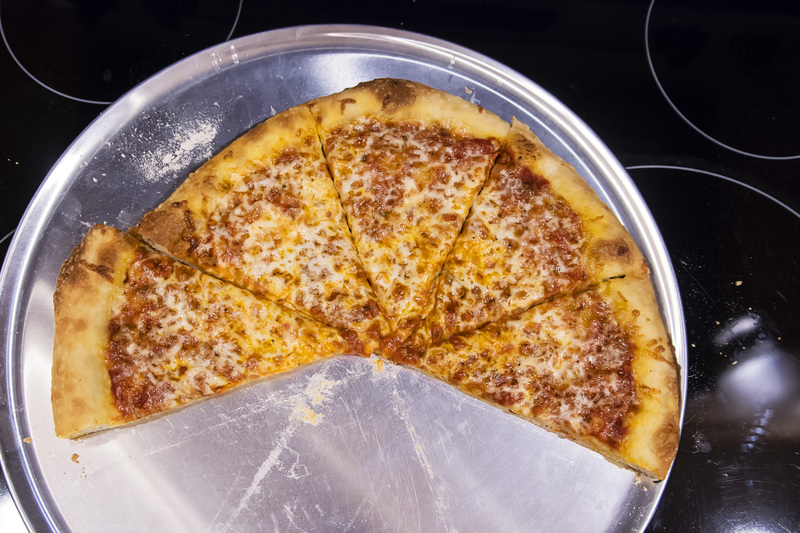 We dig it, but the ultra-thin cracker-like crust keeps us from classifying it as traditional pizza. It’s good, but we stick to small doses. MoMo Pizzeria & Ristorante is the only place we will actually endorse. The pizzas you’ll find on the menu are Neopolitan style and wood-fired, and there are some really incredible flavors. Stevie has always been a fan of plain cheese pizza, but even he enjoyed sampling some of the unique toppings like Lobster & Shrimp Hollandaise and Prosciutto & Egg. One day, by chance, Stevie found that by asking the server if we could have just a plain cheese pizza for Cadence that he could get a smaller version of the closest to true NY-style pizza we’d found since leaving New York. Major props to MoMo (for both the pizza and for having hands down some of the finest food in Lincoln). Still, because we just couldn’t seem to find any true NY-style pizza, I made it my mission to figure it out. And I did, back in 2015. You can CLICK HERE to read all about it. Since then, we haven’t bothered to order to eat a pizza anywhere but in our own kitchen, and we don’t have a desire to. Well…unless we hope a plane and head back to New York. In that case, we might have to make an exception. 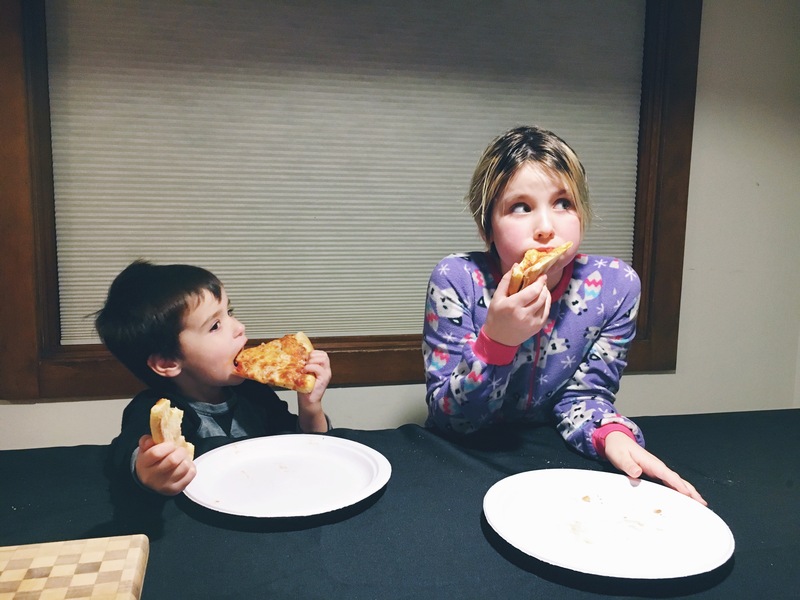 Tonight, it was homemade pizza for dinner, and I couldn’t have been any prouder than the moment I looked across the table and saw my kids’ New York come out. Henry had a slice in each hand and was eating it almost as fast as I could make it, and Cadence was folding slices in half like a pro. What can we say? We’ve taught them well.